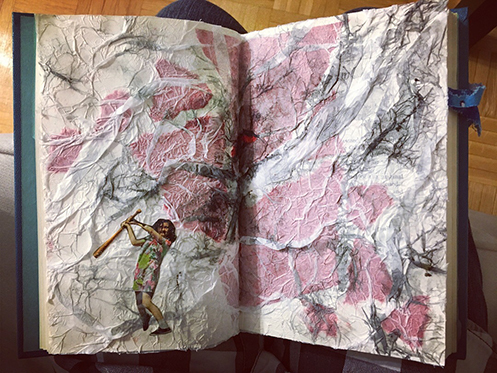 I was invited to an altered book workshop a while ago. It’s a great way to journal. 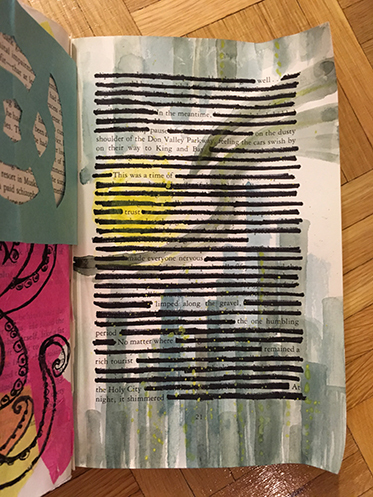 I altered a few more pages after I went to the workshop. 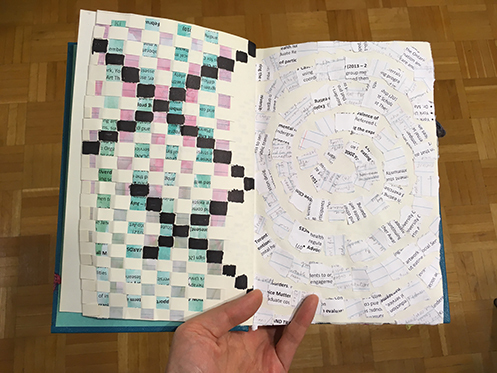 The above is a section that I managed to finish in the workshop, done by gluing many pages together in the end of the book, then cutting a window through all the layers, then gluing it down to the back cover. 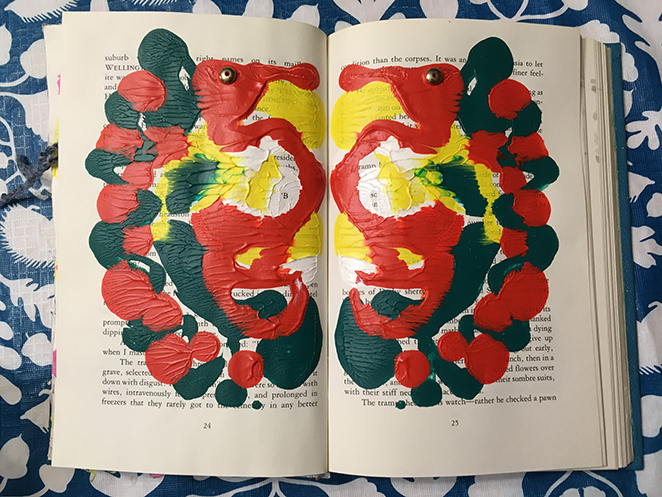 I then tried to experiment with this tissue paper painting method, but I think one needs to use special tissue paper that “bleeds”, which are not the ones from the dollar store. 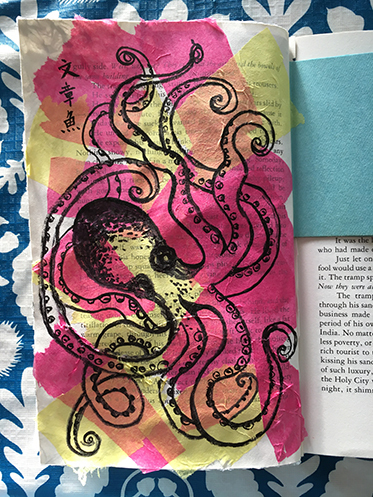 So anyway, I thought I’d paint an octopus instead. The Chinese characters say “octopus of prose”. on the dusty shoulder of the Don Valley Parkway, feeling the cars swish by on their way to King and Bay. Then I worked on the cover. 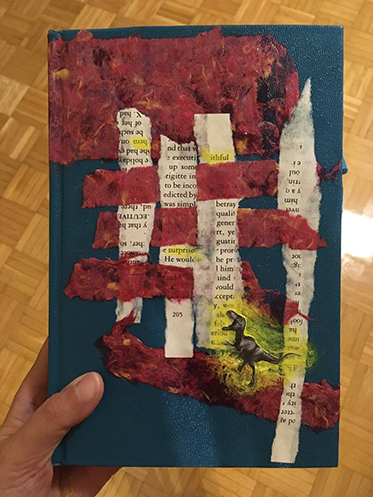 Weaving words and handmade paper and the roars of an Albertosaurus (she’s from my Tyrrell Museum ticket). 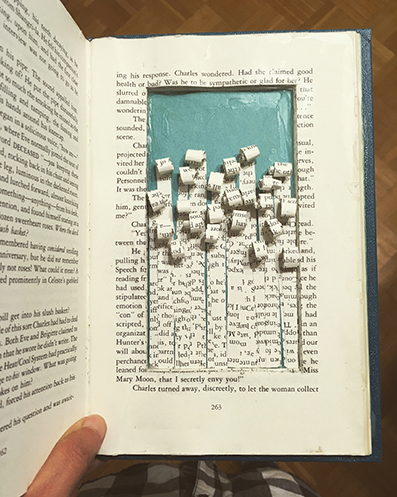 The book form lends itself naturally to mirror image printing. I thought this looked like a sea dragon rising. 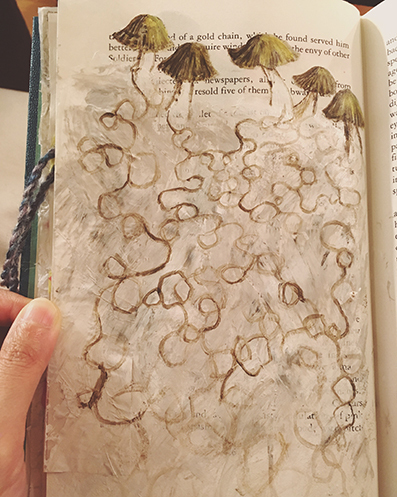 I called this piece “Mycelium Running,” which is also a very cool title of a book about the unseen organisms that keep the balance of the earth. Mycelium is the vegetative part of a fungus. Not the roots, but rather the branches. And the mushrooms are the fruits of the fungus. Mycelium is vital in ecosystems for its role in decomposing plant material, and it comprises of some of the largest organisms in the world. This is called “mincing my words,” made after I royally failed a job interview, and remembering other interviews that didn’t go as I hoped. With pieces of my handwritten notes from school and resume, and feeling like I was pretending to be who I was not, going in circles and nowhere. The weaving on the left and the X’s were a way of me saying “NO” to the whole thing. This is my favourite. It’s called “Revenge of the Upside‐Down”. But we, we who are female, we who are racialized, we who are different from the so‐called norm, are not backing off. Close‐up of the glitter and determination! 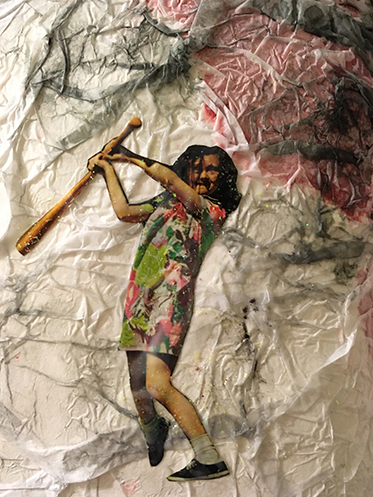 So, I thought it’d be fitting to post about this project today, and to end the post with this particular image, as I’m transitioning from full‐time frontline work to academic work in the fall, starting a new chapter, wading through uncertainties, chasing a dream. 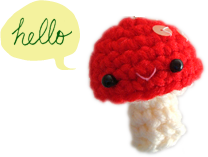 In the meanwhile, I’ll have a summer with less work and more time for craft and fun adventures :) Stay tuned for more projects and pictures! Thank you for journeying with me, always.